I would like to extend and invitation for your to attend our Lodi Street Faire as a vendor on May 6 or October 7, 2012. You can register on line at http://www.lodichamber.com, select Street Faire, then register now. soapylove…marvelous! thanks for such a nice intro ann marie! I love her soapy creations, she does a great job. IS love her site. On a side note…I was in Michael’s tonight and noticed the price of their 2# block of clear m&p ($8.99). Holy crap! I love Michael’s, but I’m glad I ordered mine in time and didn’t have to make a last minute glycerin run. This are just incredible! SoapLove’s creations are just brillant. I sure wish I could take that class…still watching for good airfare and seeing if I can get dh to agree to fly to Seattle instead of direct to Vancouver…. Thanks for this write up, Anne-Marie! These soaps were really fun to make and I’m happy to share some tips. I was excited to see that you now sell silicone brownie pans for soap making. That is my #1 most used item! 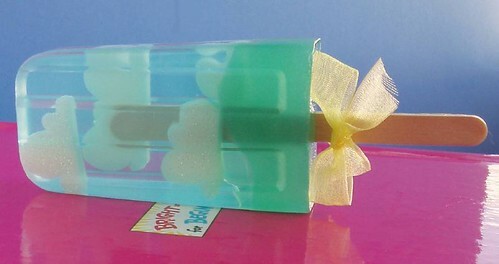 I think every glycerin soap crafter should have one. They’re invaluable!